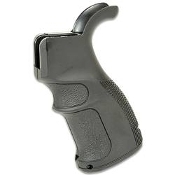 Textured, ergonomic AR-15 pistol grip is manufactured in Israel and designed for increased comfort and trigger control. Features an accessory storage compartment that includes a double CR123 battery storage sleeve. Easy to install. Does not included mounting screw.